What motivates their content creation? What excites them? What is their background? How did they get here? What are the ranges of hardware and software used by content creators and what are their workflows? How do they make decisions about what hardware and software to acquire and how do they acquire it? What drives them to refresh or change their computing systems? What is critical to their business? What are their computing pain points? What value propositions do they identify with? How do they make money and create value? What new technologies and new interaction modes interest them? What capabilities do they currently lack? Research participants also completed a card sorting task with 15 different pain points about using desktop computers that had been provided by the marketing team, and blank cards where participants could add their own challenges. Participants sorted these pain points on a grid that represented the level of annoyance they experienced with the pain point, and the level of frequency encountered in their work (see Figure 2). This type of structured activity, completed at the end of the interview, provided a useful opportunity to explore the prior behaviors from the interview in relation to the types of trade-offs that the Desktop Business Unit wanted to understand better. Figure 2. Card sorting activity of computing pain points mapped out by Level of Annoyance & Frequency Encountered. Substantial time was also spent with research participants outside the interview setting, and in other contexts relevant to them, although not always with those who participated directly in the study. One member of the team participated in a weeks-long mixed reality development course. The team attended a professional conference for content creators, ate meals with participants, and immersed themselves in the content creation culture in each country. For example, in both the US and China time was spent in co-working spaces to understand how solopreneurs use these environments to create business connections. 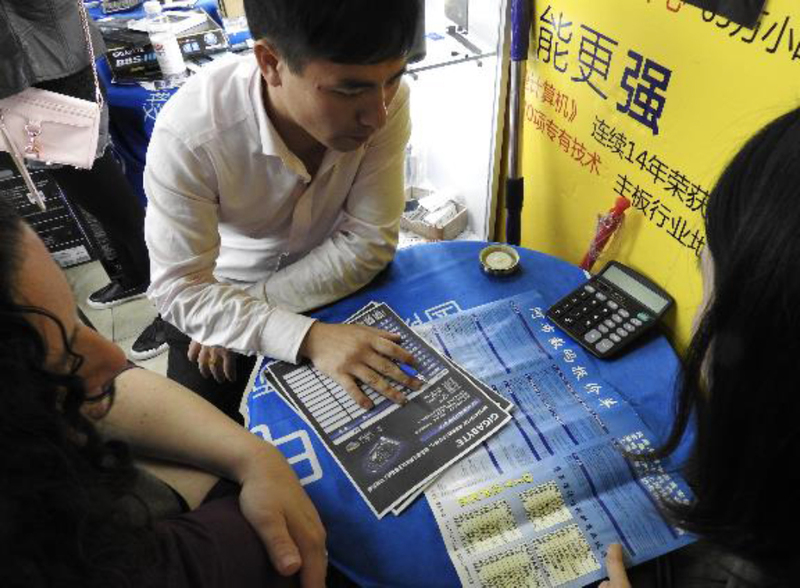 In Shanghai, the team also went through the sales process of buying a computer just as several participants described doing themselves (see Figure 3). Figure 3. Buying a PC in a Shanghai computer mall, the computer consultant advised the team to buy less expensive parts for our proposed virtual reality activity. In Seoul the team was able to revisit two research participants that had been part of multiple Intel content creation studies dating back ten years, and who had formed collegial friendships with the Intel team. In one case, the team was able to attend a rehearsal for a multimedia experience inside the walls of the largest royal palace in Seoul, as one of the content creators projected images on the palace's facade. 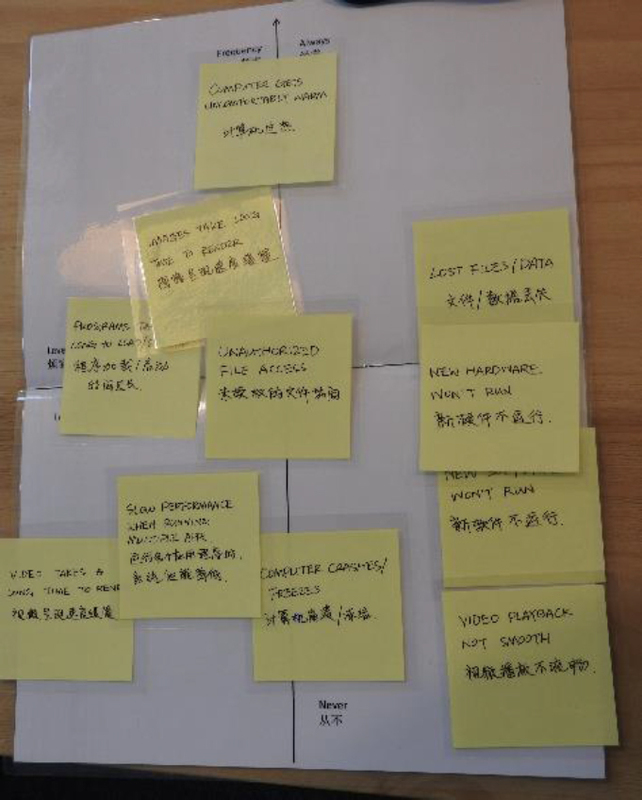 These additional activities provided a richer context for relating the interview data to first-hand experiences, and helped the Pathfinding Team more deeply understand creators’ perspectives on how technology supports their work and professional goals. The Desktop Business Unit stakeholders had not previously worked with ethnographers, so the Pathfinding Team set up project timelines to have constant feedback loops, both through workshops and organizing opportunities for stakeholder participation in the interviews with research participants. These check-ins served important functions: 1) they brought the stakeholders into the ethnographic process of analysis, 2) they allowed the team to take the time needed for this project while maintaining a strong communication line with the stakeholders, 3) they gave the Pathfinding Team the opportunity to incorporate a deeper understanding of the stakeholders’ concerns into the research itself, and 4) they enabled a staged expansion of the project over time as the Pathfinding Team built trust and credibility with the Desktop Business Unit stakeholders. By bringing stakeholders into the analysis, the team created a space for the stakeholders to share reactions and perceptions about the research data which was used by the team to refine the segmentation. In order to shift their assumptions, stakeholders had to deeply absorb the data themselves and experience it; this would not have been possible had the Pathfinding Team created a set of finished insights. With workshops built into the process, the team was able to co-create insights with stakeholders that could only emerge out of the conversations and reflections that were shared together. One Desktop Business Unit stakeholder who participated in interviews at a commercial video editing house was so transformed by the fieldwork experience that he continuously referenced stories of the participants throughout the workshops and follow-up conversations. The insight that the stakeholder found most surprising was learning that the labor intensive part of post-production (transcoding videos) was offloaded to junior team members who were using computers that were too slow for this type of work–yet all the buying decisions were made by the creative lead who did not realize how slow the process was for the support team. By participating in the fieldwork directly, the stakeholder internalized the importance of job roles, and power relationships, in new ways as they related to the Desktop Business Unit goals. Collecting insights about digital content creators, identifying and understanding behaviors around workflows and the use of technology. Draw stakeholders into directly working with the stories and insights about computing pain points. Test the idea of the tech orientation segmentation in its early form. Validate the structure of the tech segmentation in completely new geographies and identify differences in participant behavior that may be impacted by cross-cultural factors. Translate structure of segmentation into actionable business activities, such as marketing plans and talking points for executives. After completing fieldwork in Los Angeles, the Pathfinding Team organized and analyzed the research data into an initial set of insights that highlighted key user stories and responses to initial stakeholder questions. These stories were crafted into user profiles which consisted of photos, quotes, and relevant points about the participants’ behaviors and technology use described in detail. a) What does the technological environment of a creator look like? b) How does a creator learn about new software and hardware tools? c) What is the workflow and collaboration process of a creator? The workshops succeeded in helping the research team test stakeholders’ comprehension and perceived actionability of the technical orientation segmentation. The workshops also provided the stakeholders the space to insert their own point of view and point to areas where they wanted to know more. One contested topic was the relevance of the Pathfinding Team's feedback that even Tech Whizzes, technically savvy and often highly skilled users who enjoyed researching, talking about, and building out their own hardware and software configurations, complained that the CPU component sold by Intel was extremely difficult to update and replace as a new part. The Pathfinding Team had anticipated that this issue would be considered a priority topic to be analyzed further, but the head of the Desktop Business Unit immediately dismissed this finding as well-known and not an insight that he considered actionable at that time. These types of discussions helped ensure that the recommendations and next steps being offered by the Pathfinding Team would be accepted into the working plans of the stakeholders. It also facilitated a level of investment in the project by stakeholders who felt and saw their concerns actively taken into account in the execution of the research and analysis, and enabled a staged expansion of the project over time as stakeholders came to see the value of it, and asked for more. Ethnographic fieldwork exposed differences among professional digital content creators that led to the conception of a new market segmentation. The research conducted by the Pathfinding Team was substantially different from the research used by the corporate Market Research Group in forming their segmentation, resulting in a new way of thinking about the market. The Market Research Group had used a quantitative survey to look at the size of the market, and to quantify what content creators were doing, but not why or how. The resulting segmentation was based on creators’ professional standing (professional, prosumer, mainstream), and not on their workflows and values. The Pathfinding Team used qualitative, in-depth research to understand content creators’ behaviors, motivations, and attitudes. The Pathfinding Team segmentation and the Market Research Group segmentation had very different inputs which resulted in completely different outputs. Early on, the Pathfinding Team was struck by stark differences among the content creators in behavior and feelings about technology. While some research participants passionately delved into the distinctions between generations of CPUs identified by corporate code names, and reminisced about their first forays into building their own PCs and hacking firmware, others were emphatic in their total lack of interest in such details. The less technically focused creators wanted to know as little as possible about computer specifications. They wanted the right computer to get the job done while taking up as little of their time and attention as possible. Insights from the life histories of both professional and Gen Z participants made it increasingly difficult to support hard distinctions between professional and non-professional creators. At the same time, insights showed increasing differentiation among professional content creators in terms of how they related to technology and technical specifications more broadly.